Fig, Maple, Hedge, and the whole Tumble Leaf gang are back. Today, Amazon announced the children’s animated series will return with new episodes in May. 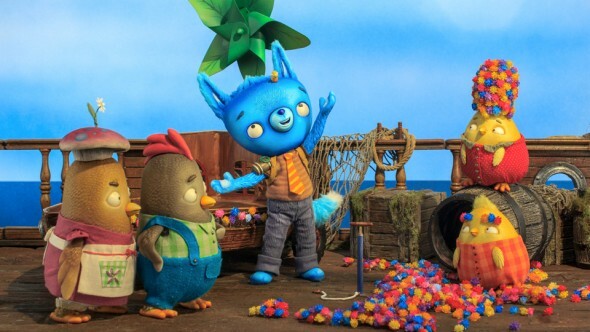 Created by Drew Hodges, the stop-motion series follows the many residents of Tumble Leaf island, who teach young viewers basic science lessons. New episodes will be released on May 6th. On Friday, May 6, new episodes from the second season of Amazon’s multi-Emmy award-winning original preschool series, Tumble Leaf is scheduled to debut on Prime Video. Join Fig, a delightfully curious blue fox, and his best, wiggliest caterpillar friend Stick as they embark on new nature-filled adventures and discover science through play! Created by Drew Hodges (Community) and executive produced by Hodges and Kelli Bixler (The Roadents) of the award-winning studio Bix Pix Entertainment, Tumble Leaf features voice work from Christopher Downs as Fig, Brooke Wolloff as Maple, Zac McDowell as Hedge, Addie Zintel as Pine, and Alex Trugman as Ginkgo. Fostering lifelong creative learning, Tumble Leaf features lush worlds and playful stop-motion animation that last year garnered four Daytime Emmys and the Daytime Emmy for Outstanding Pre-School Children’s Animated Program, earned the Jury Award for a TV series at the 2014 Annecy International Animated Film Festival, the 2015 and 2016 Annie Award for Best General Audience Animated TV/Broadcast Production for Preschool Children, and a 2015 and 2016 Parents’ Choice Gold Award. Most recently, the series garnered a Daytime Emmy for Outstanding Individual Achievement in Animation and nominations for Outstanding Pre-School Children’s Animated Program, Outstanding Directing in an Animated Program and Outstanding Costume Design. Scot Osterweil, Amazon’s Thought Leader and advisor for Tumble Leaf, is Creative Director of the Education Arcade and the Game Lab in the MIT Comparative Media Studies Program. He has designed award-winning games in both academic and commercial environments, focusing on what is authentically playful in challenging academic subjects. He is a founder and President of Learning Games Network (www.learninggamesnetwork.org) where he leads the Gates Foundation’s Xenos Language Learning Initiative (ESL), and where he designed Quandary, named Game of the Year at the 2013 Games 4 Change festival. What do you think? Do you have Amazon Prime? Do your kids watch Tumble Leaf? More about: Amazon TV shows: canceled or renewed?, Tumble Leaf, Tumble Leaf: canceled or renewed?